Commander "Caid" Nottoris, Advisor of First Light Clan. Clan Leader Commander "Windguaerd" Wagner from Mercury Dragons Clan. 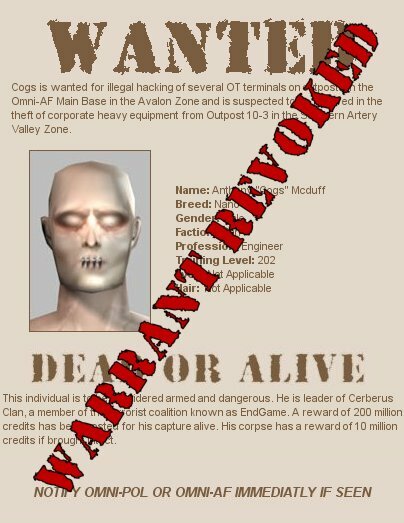 Clan Leader Anthony "Cogs" Mcduff from Cerberus Clan. Isobel "Ailish" Nottoris, Advisor from First Light Clan (wife of Commander "Caid" Nottoris). 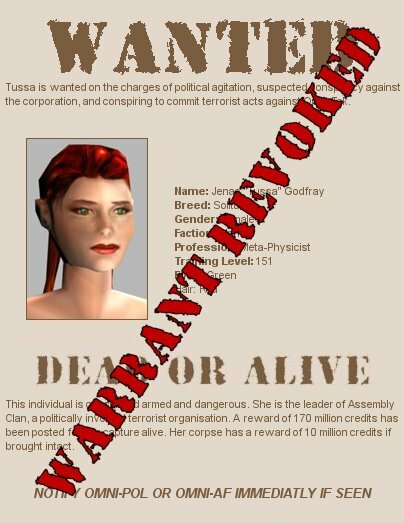 Clan Leader Jenae "Tussa" Godfray from Assembly Clan. 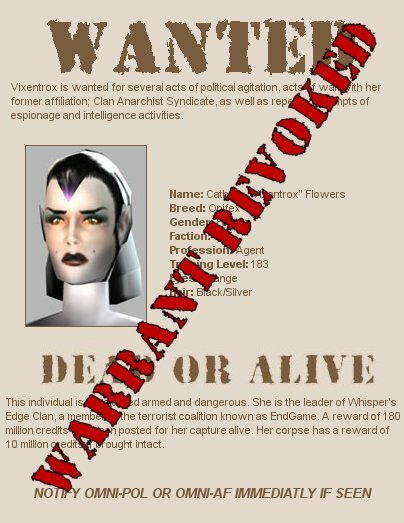 Clan Leader Cathern "Vixentrox" Flowers from Whisper`s Edge Clan. Former Council of Truth Spokesman Henry Radiman. 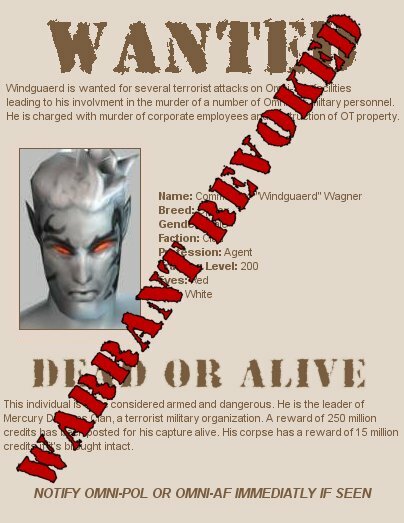 This does not mean that they are free of the charges we have on record; if they are found in omni territory, they will certainly be detained for questioning regarding the charges we have on them. 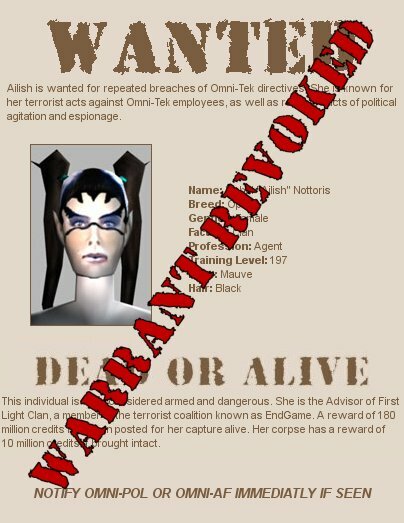 We at Omni-Pol will abide by Omni-Admin's decision; but let there be no mistake, if any of these individuals is within our grasp, we will do our best to apprehend them without hesitation. Please direct any questions regarding this case to Captain Lorenzo Winallama at Omni-Pol Headquarters. 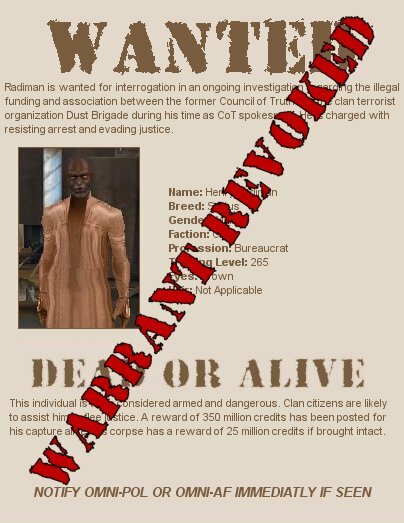 The holographic wanted posts that have been displayed in the Trade and Entertainment districts and all outposts and bases for almost four months have now been marked as 'Revoked' and standing orders to Omni-Pol and Omni-AF personnel to no longer pursue those who were wanted in clan territory. It does surprise me that Omni-Admin would issue an order to stop hunting down those who are trying to reform a new Council of Truth and bring a strong unity to the clans. The following are copies of the holo-posts that are now being displayed. This would confirm the statements from General "Gencop" Fahrni during the recent interview I had with him, however is this a show of good faith from Omni-Tek or is it damage control to avoid the galaxy to believe that they would stop the clans from forming a legal body of government and reach a peaceful agreement with them again? With the recent appearance and speech by Mr. Radiman in Tir City and the renewed interest of clans to rebuild a new Council of Truth if they were to have the backing of the majority of clans, then the ICC would have to recognize them as the new ruling body of the clans, and perhaps agree to negotiate a new peace treaty or accord to avoid the disruption of notum production on Rubi-Ka. There are still questions, from omni and clan side. Where was Mr. Radiman during the days the original CoT evacuated Tir? does he know why did the Council that lead the clans for over 80 years disappeared and left the clan capital practically unprotected? 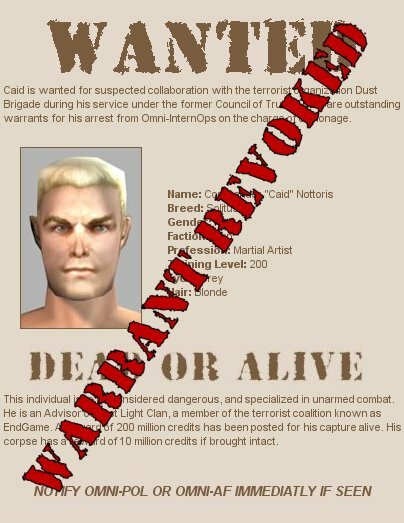 did he have any knowledge of anyone within the old CoT being involved with the Dust Brigade? Where exactly did he go after the CoT left Tir? will he regain the trust of the clans?